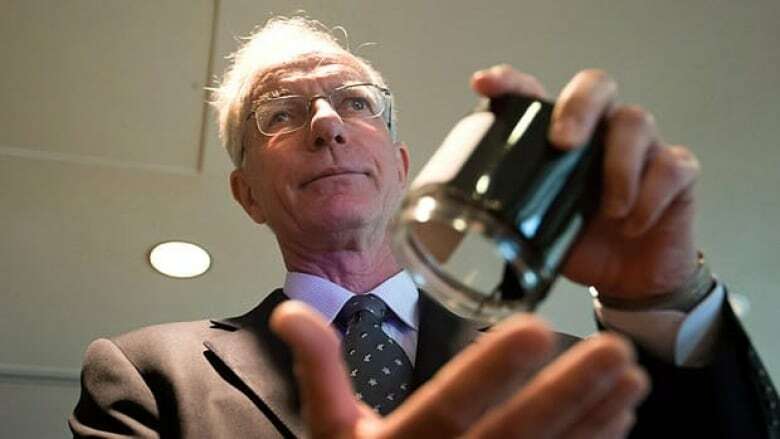 Media mogul David Black says Canada is ignoring the potential for refining oil here on the West Coast to its peril, and adds that his own oil refinery proposal could present the solution. Black, a businessman and owner of Canada's largest private publisher, Black Press, first proposed his own oil refinery in Kitimat on B.C. 's North Coast in 2012. His proposed refinery — which would be the 12th biggest in the world — would cost billions of dollars and refine Alberta crude brought in by rail (since the Northern Gateway pipeline is no longer an option). He told CBC's The Early Edition his project would be better for the environment than Kinder Morgan's Trans Mountain pipeline expansion project. Black said the problem isn't building the Trans Mountain pipeline, but the increased tanker traffic carrying products like diluted bitumen. "If there's a spill of diluted bitumen ... half of it will sink in the first couple of hours," he said. "It will go right to the bottom, pave the bottom of the ocean and we can't get it back.... We'd be crazy to let this happen." He said shipping refined oil like gasoline, jet-fuel and diesel off the coast from his refinery would be safer than crude products and said these products would be easier to recover in case of a spill. Black said his refinery proposal would create 5,000 jobs in contrast to the Kinder Morgan pipeline proposal that he claims would actually lead to job losses. "There'll be an extra 100 to 200 jobs on the docks and the boats where there's extra tankers coming into town, but we're going to lose almost assuredly the only refinery we've got," he said. The future of that refinery — operated by Chevron in Burnaby — has been in question since it was put up for sale in June 2016. On the Early Edition, Black said the refinery would likely close down in a few years because he claimed it isn't built to handle the diluted bitumen coming in by pipeline. He also claimed most of the oil it was currently refining was being brought in by train. Adrien Byrne, a representative for Chevron, disagreed with Black's assessment. He said while it's true the refinery doesn't refine diluted bitumen, it does refine an upgraded synthetic crude. Kinder Morgan's Trans Mountain project has said it will ship both refined and unrefined products via its pipeline including heavy crude oil and diluted bitumen. Byrne also clarified the vast majority of crude oil refined in Chevron's Burnaby refinery is still shipped in by pipeline, not train. And, although the refinery is still for sale, Byrne said no decision to sell has been made. In Tom Gunton's opinion, however, Black's refinery dreams are less likely than ever. Gunton, the director of the Resource and Environmental Planning Program at Simon Fraser University, credited Black for pointing out that much of Canada's current oil exports are unprocessed and a lot of jobs are lost because of that. But he pointed out there's very little incentive for oil companies to use a B.C. refinery when they already have existing refineries they ship to and contract with. Gunton also expressed concern whether B.C. — and particularly Kitimat — would be the best location for such a refinery. "Building the refinery in Kitimat will do nothing to reduce the risk for the Kinder Morgan project," he said. "The refinery itself would generate additional tanker traffic which would create additional risks in B.C." He pointed out a better way of increasing refinery capacity in Canada would be pressing the Alberta government to require more processing before export.